Located outside Santa Fe, New Mexico, along I-25, the historic La Cienega neighborhood boasts an excellent location, fantastic residences, access to plentiful entertainment opportunities, and much more. Regardless of your interests, you will not struggle to find enjoyable activities to fill your free time when you choose to live in this neighborhood. Whether you are interested in nature, the arts, or metropolitan life, you are certain to discover entertainment options that will complement your favorite pastimes. Available properties in La Cienega include beautiful single-family homes that are ready to impress you. Now is the time to consider what it would be like to live in this neighborhood. As a resident of this neighborhood, you will appreciate beautiful landscaping and ample entertainment opportunities. For example, if you like spending time outdoors soaking in the sunshine, then you will enjoy exploring the many nearby parks and natural areas. Envision an exhilarating hike, a relaxing bike ride, or a delicious picnic lunch with gorgeous views. These activities can easily become part of your everyday life when you choose to live in La Cienega. When you are ready for a more metropolitan adventure, look no further than Santa Fe. This capital city is full of enjoyable entertainment options. Known as an arts hub, this city offers a wide variety of interesting museums and impressive art galleries to explore. Regardless of your preferred style of artwork, you will enjoy the wide variety of eclectic art that exists in this city. In addition to exploring the arts scene, you may also choose to dine in one of your favorite restaurants or attend a fun local event or festival. No matter where your adventures lead you, you will be content to think of your La Cienega single-family home awaiting your return. An excellent location, beautiful residences, and ample entertainment opportunities ensure that you will enjoy living in this neighborhood. Homes for sale in La Cienega are ready to pique your interest, and you are sure to find something that suits your style. 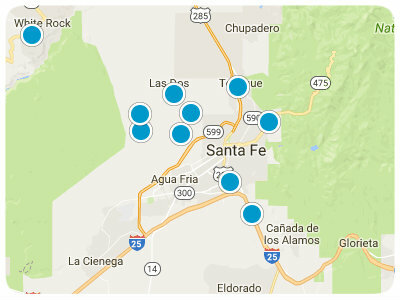 If you are ready for more information regarding La Cienega, Santa Fe, real estate options, please do not hesitate to contact us.